And knitting I shall provide! The first is a gift for a gal who shall be known henceforth as Enabler Jess, deliverer of White Chocolate, Super Secret Contraband, jealousy-inducing Skye photos, and armloads of Shilasair yarn. A scarf is the least I could do in return. 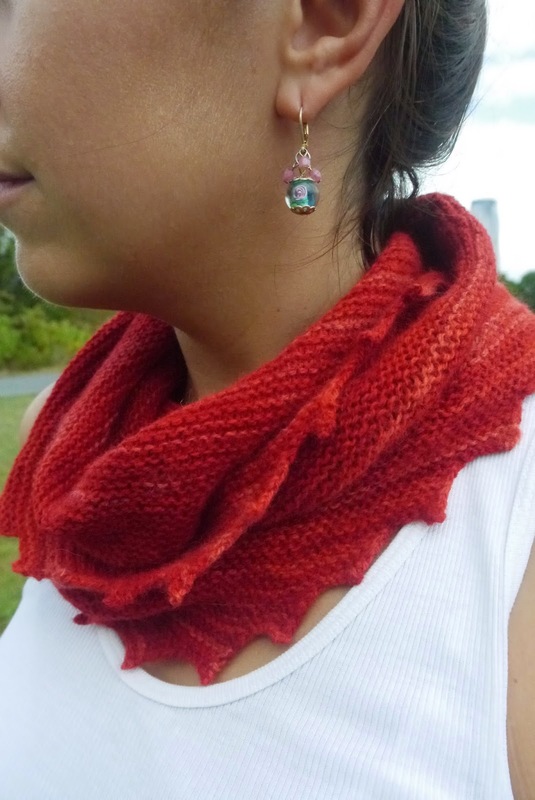 Per Enabler Jess' request, here is Hitchhiker in Shilasdair Luxe 4-Ply in Rowan Berry. I suffered from a bit of anger while knitting this, because the yarn is delicate and if I pulled it too hard it snapped (said snapping induced the anger which induced harder pulling...a vicious knitting cycle). I also screwed it up occasionally, which made me angry at me because hello, it's garter, how do I keep screwing up garter? But when I tried it on to take the photo it was all worth it and I didn't want to take it off, but don't worry Enabler Jess, it's all yours. The second is Honey Cowl, knit with my handspun. It did not cause anger, only vast amounts of boredom. I love other people's version of this cowl, and clearly for them it was all worth it, but...meh. I don't hate it, in fact I took that photo minutes ago and am still wearing the cowl and it's not scratchy like I thought it would be and though the colors aren't exactly my favorite they don't look bad on me, but it just doesn't glow like everyone else's Honey Cowl. Sigh. Parker thought it was absolutely gorgeous. She's fond of seaweedy color combos.